Good book! I was going to listen but about half way through the first chapter I realized I needed the maps and the genealogies available in the Kindle version – also I like pictures. 🙂 So I listened and read along on the side. This book starts where Jones’ The Plantagenets left off, but there is no real need to read that one first. This stands on it’s own. 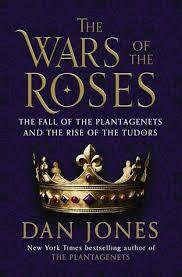 In fact, for me, The Wars of the Roses is more interesting than The Plantagenets. The Wars of the Roses covers a much shorter period of time so there aren’t so many names. There is more emphasis on the personalities of some of the personalities – Henry VI, Edward VI, Margaret of Anjou, Richard of York, Warwick, others. Without excess description or foreshadowing Jones presents a splendid narrative, conveying the information and the tension of those times when all of England was at stake between 3 feuding families. It is suspenseful even if the reader knows how it ends and Curless does a fine job (after he gets into it). The feel is so definitely like a medieval tale, there is no evidence that any kind of Renaissance as was going on anywhere. But that didn’t happen in England until almost a century after it started in Italy. Nevertheless, at the end of Henry V’s reign peace and prosperity were at hand. In England we have an only child, a baby king, Henry VI (a Lancaster later symbolized by the red rose) who grew up to be totally unequipped for the job intellectually, emotionally, spiritually – rather he was pious and sweet, innocent and benevolent – also mentally unstable. Much of the discord grew around what to do about government in the face of such incompetence – to say nothing of the sporadic insanity. His wife, Margaret of Anjou, took the reins as necessary but that didn’t quite cover the bill. Well, after many years of losing battles to maintain the holdings in France, many years of extraordinary expenses, the only thing to do was to find another king – right? And that, according to Jones, was the reason for the Wars of the Roses because the House of York, also stood ready with Richard III primed to do what was necessary. And the problem of succession was ultimately the reason Henry VIII (of both red and white rose genealogy) thought it absolutely necessary to have a clear legitimate, male heir. Jones’ takes a lot of the Tudor point of view, their 16th century Public Relations as it were, as his stand – that Richard III was truly a vicious scoundrel. I just don’t have the time to read this one this month, but you make me wish I did. So many books … !!! !